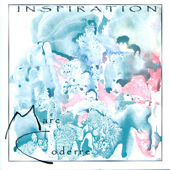 Inspiration, the second CD from Marc Coderre, released February 15 2011. Since late 2005 while we were working hard on Illumination I was already thinking ahead to the next project. Between April 2006 and December 2008, I wrote original songs for this new project as well as fine tuned my choices of which songs to ‘cover’ by other people. “Officially” studio work on the project began in July 2008, when I met with Armando Prini to discussion the project. Composers: Marc Coderre, and covers of songs by David Haas, John Michael Talbot, John Foley, Dan Schutte, and James E Moore.